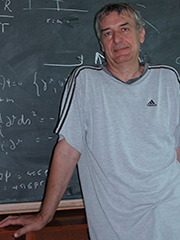 Pierre Sikivie has spent his career seeking to understand the mysterious dark matter of the universe. Astrophysicists have concluded that more than 80 percent of the matter in the universe is non-luminous “dark matter,” but little is known of its composition. It is suspected that this missing mass resides in an elementary particle, and science has zeroed in on two possibilities: axions and weakly interacting massive particles. Sikivie has created novel experimentation methods to detect axions, which are now being implemented in a large-scale study at the Lawrence Livermore National Laboratory. He and colleagues have also developed a new model for studying the structure of galactic halos and the distribution of dark matter enveloping the luminous components of spiral galaxies. In 1996, he was awarded the Jesse W. Beams Award from the American Physical Society for his work on dark matter detection. The galactic halo model Sikivie and his collaborators developed has predictions for all of the approaches to dark matter observation and detection.